2 by 3 Heroes: Why did the baby tomato get lost on the hike? Before the cards hit the binders, let's get a scan and post of a few. Starting with your favorite evening blogger, and mine, the Night Owl. I did not know there were unlicensed Thomas cards that are so... bland. 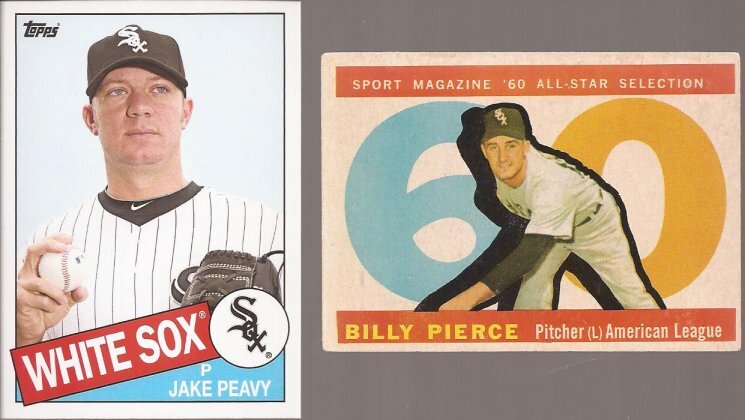 What is not bland are those '75 Topps, one regular and one MINI! Third mini in my collection, all 3 because of the Owl. Thanks! Jeff Pederson, a non-blogger, and I have this regular flow of PWEs back and forth. 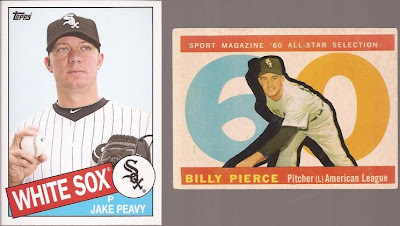 Jeff NAILED it this round with a nice ex-Sox Peavy from this years Archives, and an awesome high number Pierce for my Pierce Project. Two cards left to complete the set - who has a 53 or 54 Red Man lying around? Thanks Jeff. Vintage Cubs coming your direction very, very soon. I need to hit my card show with the vintage dealer. JD from Buckstore Cards has been ripping a lot of the new Panini Score jumbos (as have I) and pulled a nice card from the pack. One comment, a couple emails and we had knocked out a quick trade. I'll get to that card, but here's some of the rest in the envelope. Well mustache'd Hawks. Graham was a great, gritty player for the Hawks. 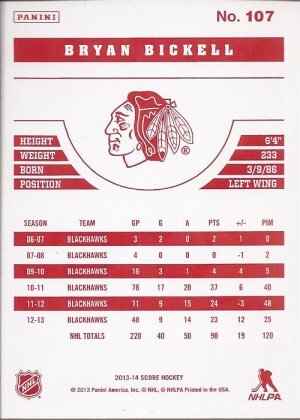 He was the epitome of the basic Blackhawk. Cam Russell - not so much, but that is a Canadian UD card. HOF-er Michel Goulet gave the Hawks a few good seasons after leaving Quebec. For the joy of 2 Cups in 4 year, I had to endure stuff like these guys. Ugh. Gold-ish goodness. Nice to get a Toews from the National Hockey Card day giveaway in Canada. Dig the card to the left. No "C" on Captain Serious' sweater. Rookie season for Tazer. The captain that year was Adrian Aucoin (and Martin LaPointe when Aucoin was injured). I say - I don't quite recognize those name. But the deal starter was this lovely card. 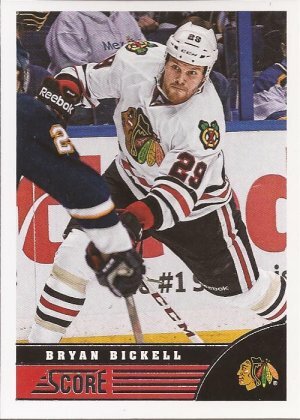 Bickell being all Bickell-y against the D.....wait.....that is the wrong side. Ahhhh. There it is. Red backed parallel. Not sure what the distribution is of these, but in the half dozen jumbos I have bought, I have pulled a grand total of... (math)... none. Thanks for the trade, JD. Last is a very small but unexpected envelope from Corey at Tim Wallach Cards. If you have never visited, he just wants all your Wallachs. It's that simple. You have them, he wants them. I have dropped Corey a couple PWEs of the Wallachs I have pulled when organizing. Never expected, nor asked for anything in return. It's fun and SOOOO simple to fill his want lists. Well, I got a nice surprise in the mail yesterday. More Blackhawks. Sweet, lovely, Cup defending Blackhawks. If he had only sent those 5 cards, I would have been more than content. Heck - I didn't even care about getting those. Then he dropped it. That, my friends, is a cross off from my most wanted list. Wow!!!! I cannot thank you enough, Corey, for that card, besides just pulling and mailing you more Wallachs. Something tells me that will make you happy. Alright, into the binders and boxes these cards go. Oh - I am not revealing the punch line to the post topic question. If you cannot figure out the answer, find a 5 year old to help. Seriously? You're totally leaving me hanging with that joke!